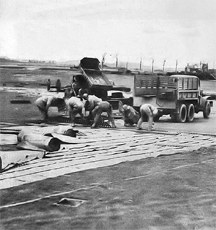 Soldiers of IX Engineering Command, U.S. Army Air Force, putting down a Pierced Steel Planking (PSP) Runway at an Advanced Landing Ground (ALG) under construction somewhere in France following the Normandy Landings of World War II. ALGs were the temporary airfields used by aircraft engaged in air support of Allied forces. One of the most serious challenges faced by the engineers was simply keeping up with the speed of the advance. This imbalance of capability between combat and engineering units can be viewed as one consequence of management debt. It is possible that a heavier investment in engineering capability, relative to combat capability, was required. Naturally, precise projection of the relative requirements was difficult prior to the event. In peacetime activities suitable precision is more easily achievable. Photo from "The Air Force Engineer," Army Air Forces Engineer Command, MTO. The concept of technical debt has been useful to decision-makers in the software engineering community, where it's used to evaluate relative costs of design choices. Choosing a low-cost approach that creates problems in the future is analogous to taking on a debt that incurs interest charges until it's repaid. Strangely, this metaphor isn't as popular in general management circles, where it may be even more useful as the concept of management debt. Management debt arises as a consequence of making choices that might be very attractive in the near term, but which create recurring costs in the long term. For instance, consider the problem of updating a mainframe-based IT operation. Although a less mainframe-intensive operation might be more effective, more nimble, and more compatible with today's labor market, the near-term cost of conversion can be staggering, due to the cost of replacing the capabilities of the custom software that has accumulated over the years. Continuing with the mainframe avoids those near-term costs, but it incurs ongoing costs in the form of inflexibility, high overhead, and inability to exploit modern technologies. These latter costs can be viewed as the interest on management debt resulting from a decision to defer payment of the "current bill" — namely, the cost of converting the mainframe operation. Here are two essential insights about management debt for decision-makers and those who support them. Since actual financial debt is usually undesirable, we sometimes regard "management debt" as undesirable in an absolute sense. Not so. Management debt isn't the problem. The problem is the "interest" — the long-term, recurring costs that result from the debt. When resources are allocated to paying the interest on management debt, the organization sometimes misses opportunities because of insufficient resources. costshow to pay down management debt, emphasize those components that generate the highest recurring costs. Use the savings to pay down remaining debt. There's a natural reluctance to commit large chunks of available resources to any effort, especially when that effort is unglamorous, or doesn't produce immediate revenue. We look longingly at alternatives that are more appealing, either because they do produce revenue, or because they generate good feelings or praise. And when we do look longingly at alternatives, we tend not to focus on the long-term costs of failing to pay down management debt. Not recognizing these costs might be an example of the cognitive bias known as the Availability Heuristic. It's difficult to imagine the long-term costs of a decision, and it can even be difficult to accept the closely reasoned arguments of experts who are able to imagine those consequences. See "Nine Project Management Fallacies" for more. Although this article and the next have held up well over the years, my work in technical debt has provided several insights that relate to management debt. Like technical decisions, management decisions sometimes have unintended consequences. For example, as the result of an acquisition, integrating the assets of the IT operation of an acquired business into the combined business might be more difficult than anticipated. The ongoing efforts to integrate the two sets of assets can be viewed as the interest charges on management debt incurred as a result of the acquisition. Again using an acquisition as an illustration, consider the case in which part of the acquired business — call it Site Beta — is located apart from the rest of the combined enterprise. Management decides not to relocate everyone from Site Beta, to save costs. But there are costs associated with maintaining this separation, too, and they can be regarded as the metaphorical interest charges on the management debt incurred by not relocating Site Beta. These charges aren't due to external causes. But now suppose that the products produced at Site Beta become wildly successful, because the new owners of Beta's principal competitor have decided to exit the market. As a result of the increased business, travel between Site Beta and the rest of the enterprise increases. This results in lost time, delays, and increased costs, which all contribute to the metaphorical interest charges associated with maintaining Site Beta as a separate operation. These additional costs are traceable to the unanticipated success of Beta's products, rather than to management's decision not to consolidate Site Beta with the rest of the enterprise. In the acquisition example above, describing the consequences of an acquisition, most would regard the IT asset integration difficulty as an instance of technical debt. My own view is that it is a technical manifestation of a management debt incurred in the course of the acquisition. The ongoing metaphorical interest charges ought to be charged to the acquisition, rather than to IT operations. Would you like to see your comments posted here? rbrenmEmLyFUuExPspDtdner@ChaclgmJhqpQxhYINpvdoCanyon.comSend me your comments by email, or by Web form. See also Personal, Team, and Organizational Effectiveness and Workplace Politics for more related articles. I offer email and telephone coaching at both corporate and individual rates. Contact Rick for details at rbrennJvYuuqmoUIpLBwNner@ChacNhVTglsKQJGyXPOLoCanyon.com or (650) 787-6475, or toll-free in the continental US at (866) 378-5470.